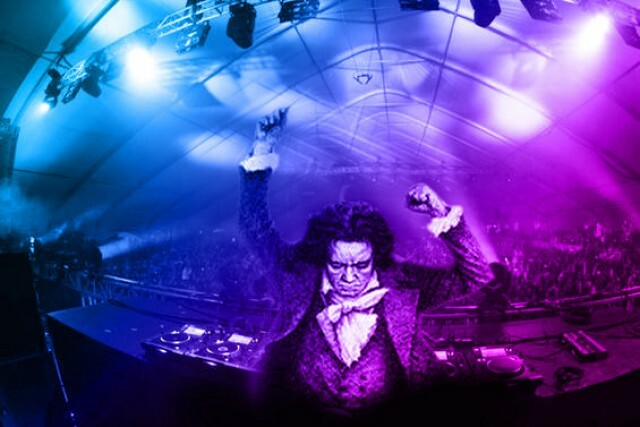 Picking up the thread of our Electronic Music Theory series, Dubspot contributor Michael Emenau looks at Beethoven’s 5th Symphony and unearths musical ideas and concepts to inspire our electronic productions. In this article, I will analyze the first movement of Beethoven’s Fifth Symphony and show you how his techniques can help you to become a stronger composer/programmer in whatever genre you wish to pursue. After that, I’ll use a dubstep piece to demonstrate the link between the past and present. If you’re not a dubstep fan, don’t worry; these concepts can be applied to any electronic dance music genre. One common element of a great hook is the repetition of a rhythmic pattern. Below is a MIDI sequence showing the rhythm of Beethoven’s famous hook. In the first 40 seconds, the rhythm “da-da-da-dah” is repeated (by my count) 33 times. This repetition establishes the main hook. Now let’s take a look at the hook with the actual pitches. There are four notes all equal distance from each other. The first three notes are short, and all the same pitch. The fourth note is longer in duration and lower in pitch. At 0:45 a second hook is introduced. In this hook, all the notes are the same distance apart, but the pitches jump around more. It’s a lighter, more lyrical hook than the first. (I can imagine this one as some tweaky Absynth mono lead patch!) At 1:21, Beethoven repeats the first hook from the beginning. Now, these two hooks, or as traditionalists would say, two themes, battle it out until the resolution at 6:37. The hooks are then reiterated one final time, and the piece is over. This “battling it out” is known in more traditional terms as development of the themes. The first theme establishes a pattern, and varies it by changing the pitches used. The theme is then developed by repeating it in quick succession. At 0:06 and at 0:26 you’ll hear the first of many examples of this technique. Another way the theme is developed is by extending it. For example, at 0:41 the theme is extended to add more notes. You’ll also hear different instruments play the same theme to create variation. And make sure to listen carefully for the “early bass drop” at 2:44! After taking some time to listen to Beethoven, take the hook of your piece and start using these techniques. Repeat the hook, moving the notes around but keeping the rhythm the same. Have different synths play the same line, extend the hook with additional notes, or condense it by removing some. The trick is to create cohesion by keeping one aspect of the hook the same, while varying others aspects. This cohesion will draw people to your track and command repeated listening because there will be something to identify with. What element of the hook gets varied and which stays the same is up to you. What makes your hook strong? Is it the rhythm? The notes? The sound? When you’ve decided, focus on that strength and create variations around it. Now let’s take a look at the track “12 Gauge” by NiT GriT and see if we can find any of the same ideas at work. The main hook is a triplet bass line pattern, which comes in at 0:47. Once the hook is established, he develops it by adding to the melodic content of the bass line on each 4th repetition, as seen below. At 1:14 the second hook, played on the organ, is brought in. As in Beethoven’s 5th, once the two hooks are established, a battle begins. The hooks bounce back and forth, intertwine, and use each other’s synthetic colors. Notice that the bass drop at 1:45 uses the rhythmic motive from the first hook. At 2:15 the first hook repeats, followed by a repetition of the second hook at 2:45. At 3:40, the development is complete. Finally, there’s a little reiteration and the song is over. Keep Your Ears Open. The Answers Are Out There! Even though these two pieces may sound as if they are from different planets, the underlying functions used to create both are similar. The repetition and variation of themes is an underlying thread that runs through much of what we refer to as Western classical music. Use this knowledge to your advantage. Draw on the great wealth of music that has already been created, and listen with open ears. Regardless of style, you can discover elements, techniques, and structures to draw on and re-interpret when you create your next track. I hope I have given you a glimpse into how you can look to past creations to inspire your future works. In upcoming posts, I will explore musical techniques from classical music other musical cultures and give examples of how to incorporate them into your compositions. Michael Emenau a.k.a. MNO has worked professionally as a musician (vibraphone, percussion, laptop), producer, remixer and arranger for 25 years, playing such diverse genres as, jazz, rock, drum’n'bass, salsa, techno, country, Hindustani, gospel, baroque and orchestral music. He has recorded on over 150 CDs, composed music for eight films, toured internationally, and lived on three continents. Michael was the house studio mallet percussionist for Sony Records (Japan) in the 90s, was a founding member of the award winning “Jazz Mafia” as well as working as a producer/remixer for Six Degrees Records in San Francisco, arranged and produced contemporary multimedia productions of the 16th-century composer Henry Purcell in Paris and is now writing a musical based on the life of Dionysus and dividing his time between Montreal and New York.